I've caught Olympic fever (along with, oh, 99% of the world). So when I heard about a circuit workout that squeezes a bunch of Olympic events into one exhausting-yet-enjoyably-thematic class, I had to give it a try. Have you caught Olympic fever (along with, oh, 99% of the world)? I’ve been glued to my TV over the past week, watching the likes of Ryan Lochte, Gabby Douglas, and Missy Franklin. So when I heard about a circuit workout that squeezes a bunch of Olympic events into one exhausting-yet-enjoyably-thematic class, I had to give it a try (at least to pull myself away from the TV for an hour!). The result: a bronze medal (full disclosure, there were only three of us taking the class today), but also perhaps stronger arms, abs, and calves. And more respect for the athletes who do this for a living. The Gist: This class features a take on summer games staples like rowing, boxing, track, weight-lifting, and gymnastics (I would have loved a chance to show off my Rebecca Soni-inspired breast stroke skills in a pool, but running and jumping in and out of water as part of a circuit, I can imagine, isn't too safe). Each “athlete” has one minute to complete as many reps as possible, for each of the five exercises. 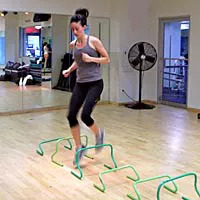 My favorite moves: Jumping over mini hurdles (they call it the “Lolo” after the U.S. hurdler Lolo Jones), as well as the trampoline weighted squat jumps (aptly named “Mary Lou” in honor of the gold-medal gymnast). Once done with all the exercises, you get to do it all over again, for a total of five sets. Oof! The best part--they keep tabs on your total reps, making it more competitive, aka, more Olympic-like (hence my bronze medal, awarded at the end). The Details: The class is going on now through August at select NYSC locations (free to both members and non-members). Check out Mysportsclubs.com for info.